According to MarketingSherpa, 79% of marketing leads never convert to sales, due to lack of lead nurturing. Think of lead nurturing as building relationships rather than selling. If what you’re selling requires more commitment and a higher price tag, lead nurturing is even more crucial to success. Having a clear system in place is the only way your prospects will be more likely to turn into customers over time, and that’s what we’re here to do. This post will give you a basic funnel explanation, 5 steps to create your own, and then go over some potential problems that may be keeping you from higher conversions with your current setup.. Your sales funnel is basically divided into 3 parts: top, middle, and bottom. You’ll see people use acronyms like “TOFU” for Top of Funnel, “MOFU” for Middle of Funnel and “BOFU” for Bottom of Funnel. 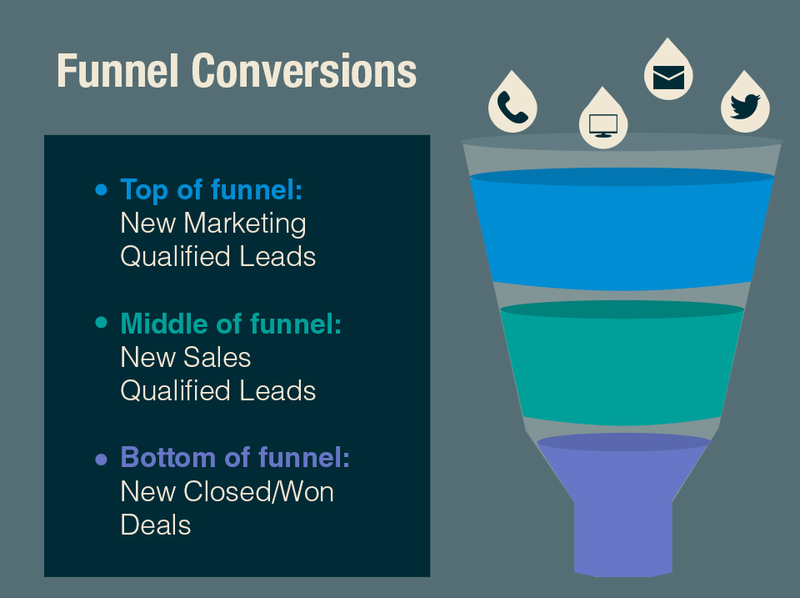 Top: The top of the funnel represents new leads. At this stage, you’re simply aiming to familiarize them with your business. Types of content in this stage would be a lead magnet (the one they probably signed up to get), welcome messages, etc. Middle: The middle of the funnel is where you’ll drip feed the bulk of your content that matches the needs and interests of your leads. You’ll also be educating them a bit about your solutions. There are so many types of potential content in this section it should really be based on your industry and customer interest. Bottom: The bottom of the funnel has your prospects making the final sales decisions. Pro Tip: While these are the three basic phases, your funnel can be segmented and set up to deliver content and solutions based on the needs and interests of your leads. Before you embark on a lead nurturing campaign, it’s important to set goals and benchmarks to keep you on track along the way. Is your goal to have a prospect open an email, click on a link, submit a form, or get on the phone with you? Everything you send them should be focused on that call to action. As your leads cycle through the sales funnel, your metrics and content will change to meet their differing needs, but your overall goal should stay the same (or close to the original). 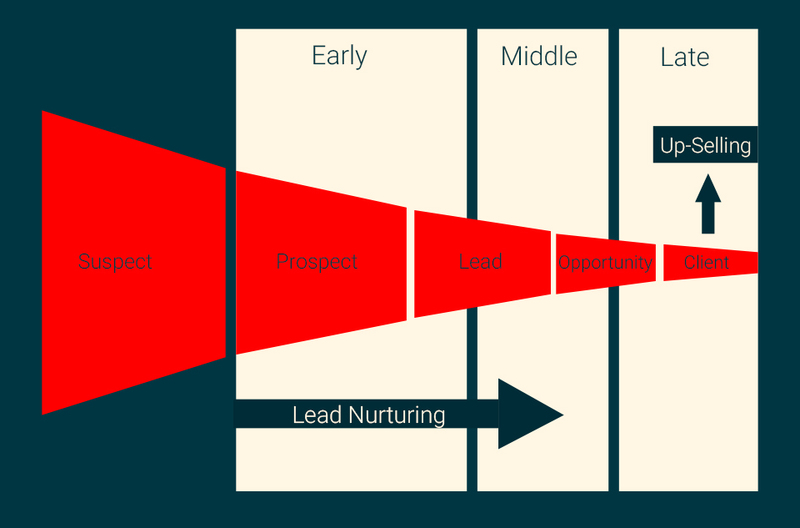 Once your pre-defined goals are met in each stage, you can move your leads to the next part of the funnel. Keep in mind all of this can be automated and monitored over time. At this very beginning stage, you can send out a high-level overview of how your company can meet your prospects’ needs and solve their problems. If your primary outreach method is through email, you can measure your success by whether they open your email or not. If they do, you can send them to the next stage. If your email goes unnoticed, you can try a different variation. Once your prospects show interest, they’re now officially in the top of the funnel. This is where you can deliver massive value and gain their trust by sending out hyper-targeted content. Content Master: The content can be in the form of blog posts, webinars, freebies, ebooks, or whatever else you see fit. The only requirement is that they’re top-notch. Varying the format will appeal to different personalities moving them on down the line towards the sale. When prospects show engagement by reading or downloading your content, you can move them to the next step. If not, continue sending the nurturing emails. Timing is important here because too many emails can irritate your prospects, while you’ll risk being forgotten if you send too few. The sweet spot seems to be every few days. Pointer: About 6 months of no engagement is a generally accepted safe time to disqualify prospects (although, it could be different depending on your industry). Mid-Funnel is a tricky place. Your prospects by now are familiar with you but they’re not ready to buy yet. The good thing is that at this stage, you know your prospects are interested in what you have to offer. This is the time to amp up content about how your products or services can help them. The content you dispatch at this stage will have very specific call-to-action, like signing up for a trial offer, viewing a demo, or talking to you in person. Once you meet your predefined success benchmark, you can move your prospects into the last part of the funnel. You’ve successfully moved your prospects to the bottom of the funnel and the only thing left is to cinch the deal. This can happen through phone calls or in-person meetings. If you followed all the steps correctly, you’ll have your prospects’ history handy and be able to know the exact moment when they’re willing to make the purchase. Your work isn’t over just because you close the sale. After you convert your leads to sales, you need to continue to build relationships, secure repeat business and increase the lifetime value of your customers. You can do this through social media, monthly newsletters, or a referral program with incentives. Retaining customers is less expensive in the long run than acquiring new ones. “But I Already Send Out Emails”, You Say? Maybe you’ve already set up a system that is meant to convert leads into buyers, but it’s not working as well as you hoped? There are several reasons for a lackluster funnel. Most of your tough nurturing battles are fought in that middle section. This is the stage where prospects aren’t quite ready to make buying decisions and you are attempting to convince them. Your leads know they’re one in hundreds or thousands of names, but that doesn’t mean they want to feel like it. It’s easy to forego personalization when dealing with leads, which only increases the likelihood that your leads will not convert. You can easily tailor content to match your leads’ geographic location, job title, product interest, and more. It’s also important to try not to sound like an advertisement to the point where your prospects feel like they’re being sold to. This can be easily avoided when your content is useful and specifically targeted. If you’re looking, you’ll quickly find out that some emails work better than others, but you won’t know until you test them. A simple A/B split test with different versions of your emails will suffice in many cases. You can test virtually everything, from subject lines, headlines, layout, body copy, images, call to action, and more. Once you evaluate the results, you can then send out your winner. Competition Advantage: Too many companies get too comfortable with the word “automation”, thinking that it’s a one-time solution to easy money. If you take the time to constantly improve your funnel skills you will have a serious edge over competitors. It’s easy to think jargon makes you sound intelligent and show prospects you know the industry language, but in most cases, it’s just annoying. Keep jargon to a minimum if it gets in the way of connecting with your prospects. Timing is crucial in lead nurturing. Even if you’re not in it for the money, sales keep the lights on. You need to know when your mid-funnel prospects are ready to buy and move them to the bottom of the funnel accordingly. If the sale doesn’t pan out, you can always continue to provide them value until they’re ready. Leads aren’t simply lifeless data, so they need to be maintained, updated, and culled if necessary. In this day and age, people change their jobs all the time, which also changes the underlying data like job titles. Keeping your leads current and your content fresh will increase your chance of successful nurturing. Defining and segmenting leads in order to deliver targeted content that both genuinely helps potential customers while educating them about your brand is a model that works. While this is a basic definition and overview, I hope that it will get you thinking about attracting new leads, providing genuine value, educating them about your brand, and converting them into clients. Lead nurturing is all about building relationships.